Cancer is a dangerous and a terrifying disease. This is an ailment that is caused in cells where the cells that have been affected shows an uncanny increase in the number of cells that abnormally multiply and that too it is way past controlling. It basically occurs when few cells break off from the primary tumor and then these cells are carried to other parts of the body in the bloodstream or lymph channels. There are various types of cancer like blood cancer, bone cancer, oral cancer, breast cancer etc. 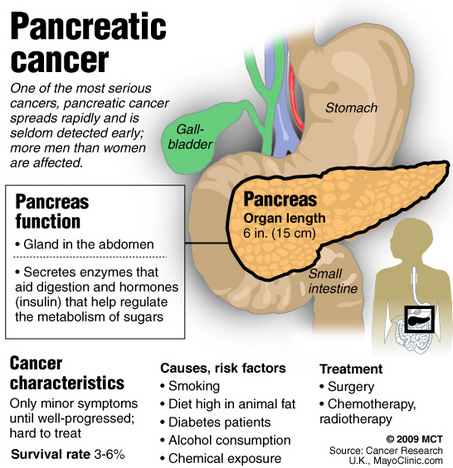 But amongst all Pancreatic cancer is one of the deadliest and relatively uncommon. 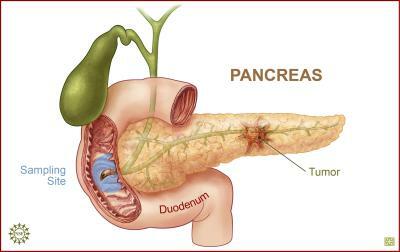 Pancreatic cancer is a malignant neoplasm originating from transformed cells arising in tissues forming the pancreas. Pancreas is an organ which is located in the abdomen. It is positioned just in front of the spine above the level of the belly button. And it is an important organ as it performs two vital functions that is it secretes the enzymes which help in the breaking down of proteins which in turn helps the body absorb it and carry out the process of digestion effectively. Then it is also the organ that secretes the hormone insulin which is the one which regulates the blood sugar level of the body. 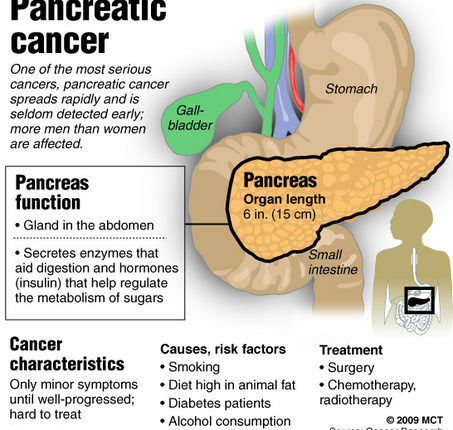 And the pancreatic cancer has been described as deadly for a reason which is that this disease slowly tip toes without making the person even realize about it because the symptoms are not that obvious in the initial stages. But as it gradually develop it is a sheer torture as there develops pain especially when a person eats or lies down in the in the upper abdomen slowly spreading towards the back. There can be several causes behind the development of this fatal health ailment. But the proper reason which can cause it is still unknown. However there are certain factors that increases the risk of getting pancreatic cancer like having a family history of pancreatic cancer or pancreatitis, obesity, hereditary nonpolyposis colon cancer, von Hippel-Lindau syndrome, having a personal history of diabetes or chronic pancreatitis, hereditary breast and ovarian cancer syndrome, Multiple endocrine neoplasia type 1 (MEN1) syndrome, Peutz-Jeghers syndrome or something trivial as smoking. 1: Severe abdominal pain due to acute pancreatitis which is a tumor that can trigger inflammation of the pancreas. Pain can also pass through to the back. 2: Inability to digest food very well, as the amount of pancreatic fluid will be reduced which can cause smelly pale faeces. 5: And one of the most prominent symptoms as the cancer advances is that the bile duct gets blocked due to which the flow of bile into the duodenum stops which leads to things like Dark urine, a generalized itch caused by the bile in the bloodstream, Jaundice (yellow skin caused by bile seeping into the bloodstream due to the blockage), Pale faeces which is caused as the faeces contain no bile which causes their normal brown color. What are the possible treatment for Pancreatic Cancer?